I continue to find the capabilities of the iPad camera to be quite remarkable. On the right, is an iPad picture of Orion taken early in the morning, a few weeks ago (early September 2016). A corresponding photo from Wiki (contributor Mouser) is also shown, on the left. Obviously, that’s a long exposure with an excellent camera on a tracking mount. 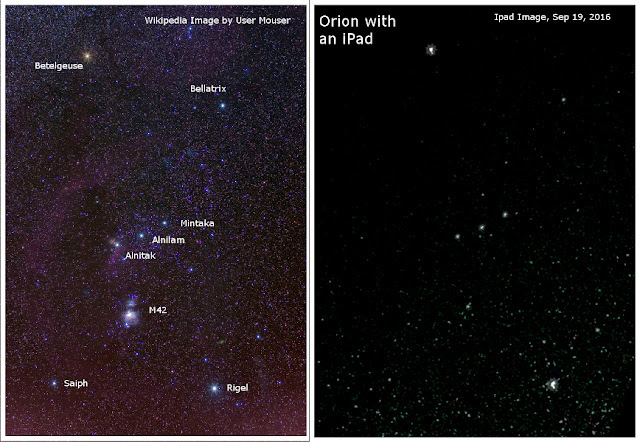 You can see how the iPad picked up many of the main features of Orion, such as the belt, Betelgeuse, Bellatrix, M42 (Orion nebula), Saiph and Rigel. A number of dimmer stars also seem to have correspondences with the Wiki picture, though some of the iPad points of light might be artifacts, so-called “shot noise” or other forms of digital noise. Note that the iPad stars are somewhat blurred – I used a “manual” iPad app, available from the Apple app site, and I believe the exposure time was the maximum available, a quarter second. Since the iPad was hand-held, there is naturally some blurring. Below is a picture of Orion that I took about the same time last year. I have labelled the main stars on that one, to make things more obvious. You can see Sirius in the bottom left corner, and Orion in the center of the picture. 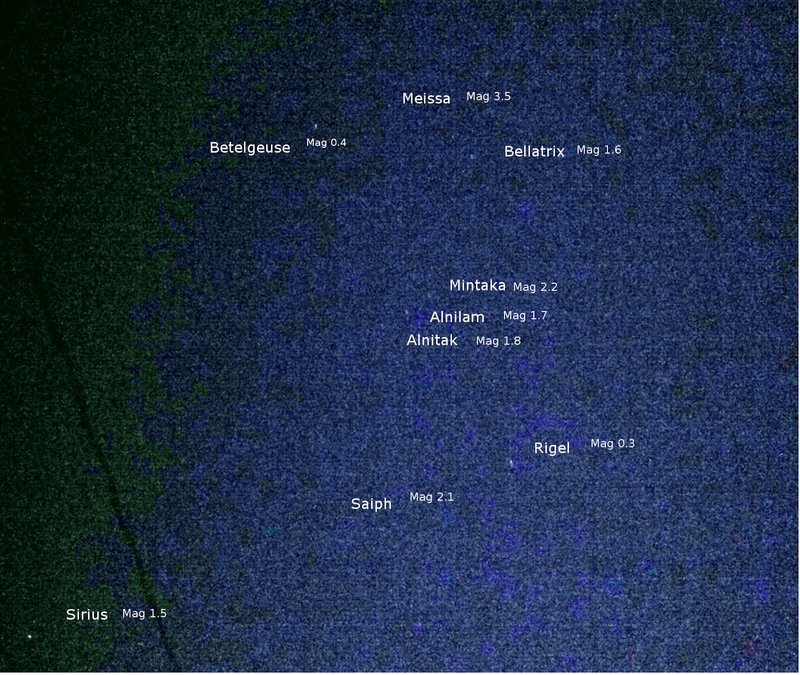 The belt of Orion is pretty easy to make out, as are Rigel, Betelgeuse and Bellatrix. Some of Orion's dimmer stars, to the right and above are also apparently visible. It’s a pretty good representation of Orion, but this year’s photo is definitely better, especially with the nice, crisp black background. Using the longer exposure that the manual app allowed made for a better picture this year – the atmospheric conditions might have been better as well (i.e. “seeing”). When you take the picture, your first reaction will probably be that there is nothing there. To see Orion, you have to take the photo of when the seeing is exceptionally good. The autumn months are often the best time of year for this, as the atmosphere is relatively dry and clear (vegetation is not very biologically active, so the air is dry). Plus, it’s still warm enough that atmospheric ice crystals aren’t interfering with seeing, and it is pretty comfortable for the photographer. After taking the picture, you have to push the image in an imaging processing program, like GIMP or even iPad's own photo editing app. Turn the brightness way up, the raise the contrast slowly as well. The stars will come out, like magic, though you will want to experiment with settings, to get the best effect. 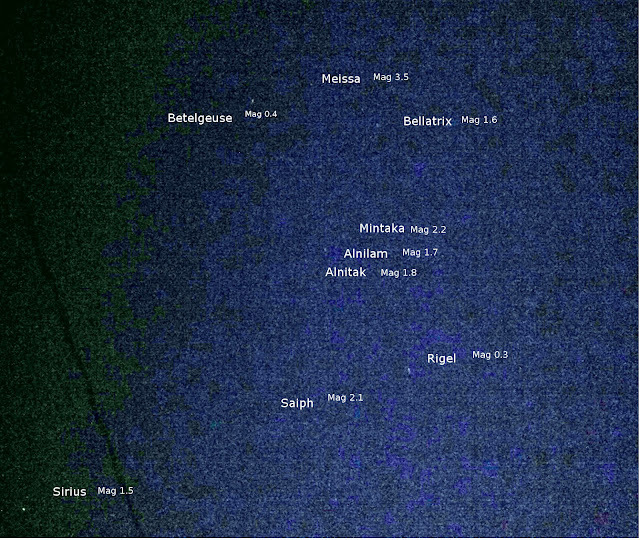 · Orion is one of the most well-known constellations, easily visible even in a light polluted urban environment. Most of the key stars are second magnitude or brighter. · It is generally thought of as a winter constellation in the northern hemisphere, since it is most visible in the evening in January, when looking due south. · It’s pretty unmistakable, once you know what to look for. It’s supposed to represent the mythical hunter Orion – in any case, it is easy to connect the dots, to see a human figure, wearing a belt. · It should still be recognizable far into the future, as its brightest stars are very far away, so their proper motion will not be very significant (they won’t drift apart, very much). · Betelgeuse will probably go super-nova within the next million years or so. It’s a red giant, and they have relatively short lifetimes. That shouldn’t have any great impact on Earth, though it would be an interesting sight. · Rigel will eventually go super-nova too. · It contains the famous naked-eye visible M42 Orion nebula, which is a stellar nursery, where stars are being born. Stars in the associated Trapezium are very young. · There are a number of other interesting deep-sky objects in Orion, such as the Horse-head Nebula. Now that you have read some real science (astronomy and astrophysics), you should read some science fiction. How about trying Kati of Terra, the 3-novel story of a feisty young Earth woman, making her way in that big, bad, beautiful universe out there. 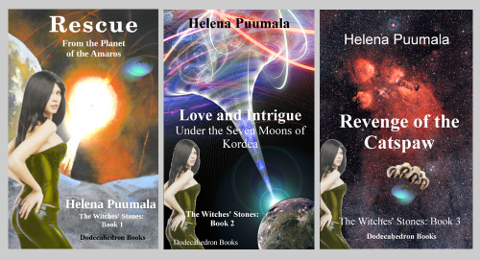 Or, you might prefer, the trilogy of the Witches’ Stones (they’re psychic aliens, not actual witches), which follows the interactions of a future Earth confederation, an opposing galactic power, and the Witches of Kordea. It features Sarah Mackenzie, another feisty young Earth woman (they’re the most interesting type – the novelist who wrote the books is pretty feisty, too).